"Why get up, may I inquire?" "Spam 'n' Pancakes on the fire." "(Gag!) I would rather eat barb wire." 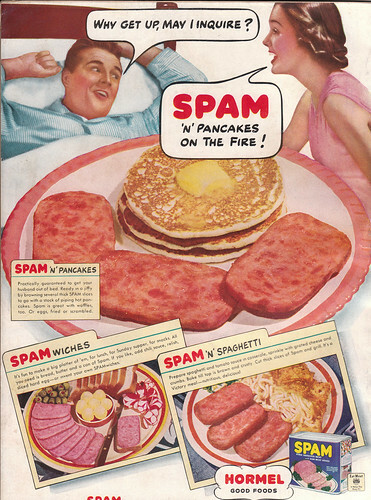 I think with my eyes closed, nose plugged, and drunk on Jagermeister, I might be able to swallow the Spam 'n' Pancakes and Spamwiches. However, no amount of preparation or substance abuse would be sufficient for me to ingest the Spam 'n' Spaghetti. Nothing wrong with a meatless meatloaf. Veggie-burgers are not half bad, so why not meatloaf? Well, my friends, this meatloaf is made of macaroni. I think if I were starving and this was offered to me, I would choose death. I loathe spam....that meatless meatloaf sounded awful too. I like spam, but not with pasta. Maybe with eggs.... definitely with rice. oh gawd I couldn't eat them, eeww spam! Fried Spam...mmmmmmhhh! I'll take spam over a spritzer salad anyday! It's not so much my dislike of spam as it is its combination with pasta. In other words, I like bratwurst,... just not in my cereal. Ya dig? I grew up in the South, KY and Texas mostly, and fried Spam with scambled eggs is pretty good... eh... to me anyway. I am begining to see how living in China makes me appreciate those lost things, like Spam and twinkies, more. This is a totally ethnocentric culture and local stores-I do not live in foreigner friendly Beijing or Shanghai- do not carry cheese or butter or even bread (yes, no bread) much less Spam or anything from that class of food. No luncheon meat or anything. They have plenty of spicy pickled Tofu or spicy pickled pig snout or spicy pickled chicken feet, but no Spam or Doritos or Hostess cupcakes. Say what you may of them, if you have no choice in the matter you find yourself sometimes actually craving a bologna sandwich on plain white Wonder Bread with real mayo and yellow American cheese at the starngest times. I have not had a bologna sandwich in five years! There are stores here that cater to foreign appetites (and foreign credit cards) but impoted itmes are taxed to death here and since all lao wai 老外 (foreigners) are "rich" they jack up the price on top of the barbaric import tax so that a can of Spam here (I saw one recently) at the import store costs about eight American dollars. Of course since it takes 7 RMB to equal one yankee greenback, and no one I know here is getting paid in dollars or Euros, it is simply too much to fork over. A box of Corn Flakes comes out to about 10 or 12 dollars here. Thats is about 70 to 84 RMB. Local Chinese people probably do not make that much in a 12 hour day of work. Now, there are Chinese style potted meats and often they totally rip off the product design of western foods (or sports wear, such as Adidas becoming Daidas, or-the best- Puma becoming Upma, or Puam, or Mupa... or....)but I want to tell you Gil there are worse things in this in this evil world than Spam. There is Spam made in China and sold in China to people who have no problem eating pig brains sold from buckets in the middle of summer!!! I would think pig brains would need to be put on ice at least. I bought a can of Chinese potted meat once and it was beyond words man. I did not even take a bite of it. It went out and I have tried to block the image from my memory. What I would not give for a breakfast now of scrambled eggs with buttered toast and fried real Spam (that sounds horrible... real Spam as oppossed to what, Chinese pirated Spam) and a pancake smothered in maple syrup. I have some rice covered in bean sprouts and lima beans waiting for me. Again. I may have to take a cab into town now and blow some of my summer bonus at a place I know that serves a passable Western breakfast. Wonderful insight, Bill, into what's for dinner in China. Fascinating!.... and I must admit, the Spam'n'Spaghetti suddenly doesn't look so bad. Warm pig brains served from buckets...yecchh! I'm eating a bowl of frosted mini-wheats right now, and I must say it never tasted so good. Spam with spaghetti does sound pretty bad. I prefer to eat my spaghetti with Treet, but that is just me. Bwhahhahhaaaa! ... you said SPAM! To quote Graham Chapman, "I DON'T LIKE SPAM!" The "meatless loaf" is just mac & cheese in brick form. Might be OK with a little tweaking. We ate a lot of Spam in my house as I was growing up. Does anyone remember a Spam product that had balls of cheese formed in the meat? My Mom bought this once and it was awful. Literally uneatable. I used to eat spaghetti with chopped up hot dogs in it all the time as a boy. Not Spam but awful close. Considering my drug problem in the late 70's and early 80's and my long term and ongoing struggle with alcohol I have probably put things into my body that God never intended for human consumption. At are house Dad did the cooking frequently. You usually got breakfast for dinner or what he used to call Chuckwagon Dinner - when you asked him what was in it he would say "I am not sure but its hot, its brown, and there is plenty of it." He would also love to cool CLICK for us. Like Spam it came with a key to open the container. What is CLICK? Its like SPAMS cheaper cousin if that is even possible. If SPAM was left over scrapings then CLICK was left over parts not even worth scrapping. One of my favorite memories as a kid was visiting an aunt in Kentucky. We'd wake up to the smell of Spam frying for breakfast. Perhaps that's why I enjoy eating the stuff to this day, including Turkey Spam! When I was little, my mom would fry up Spam and then coat it with maple syrup to give to me and my sisters. She said we loved it. I had not eaten fried Spam in a long time - 45 years or more - only to find it was a big seller on Navajo land. When you walked into the Wal-Mart in Gallup, N.M., adjacent to the reservation, you would often be confronted by a big stack maybe four or five feet high of Spam. It's a big seller out there, and Wal-Mart sold it for around $2.00/can. So when I was working out there, I bought a can, fried it up, and you know what? It wasn't bad. I wouldn't eat it every day, but once every couple of months was just about right. Now, as for the syrup - well, let's just say there are places I will not go. My palate has matured to some extent. @ uranium willy -- you forgot to mention the worst thing about food in China, notably the way the Chinese take it on themselves to "inspect" meat by touching it directly with their bare hands. So even if you wanted to cook for yourself you'd still be SOL as far as food hygiene goes.